A new Update File (Data Pack 1.01 & Patch 1.01.01) was released on 09/04/2018. Fixed an issue where incorrect logos were displayed on the uniforms of some teams. myClub: The message shown when logging in to myClub states that GP for Weekly PES League ranking has been awarded, however the GP balance on screen does not show the updated balance. Team Play Lobby: The game crashes when a certain Goal Celebration is performed in Team Play Lobby matches. Master League: When starting Master League, some COM teams transfer out many of their players, making the player numbers unnaturally low, or the players are assigned to positions that do not meet their positional compatibility. Become a Legend: When a player transfers in Become a Legend from a certain league to another, many players in the league where the player transfers in get transferred out. Including licensed leagues, stadiums, some of the latest boots and more! 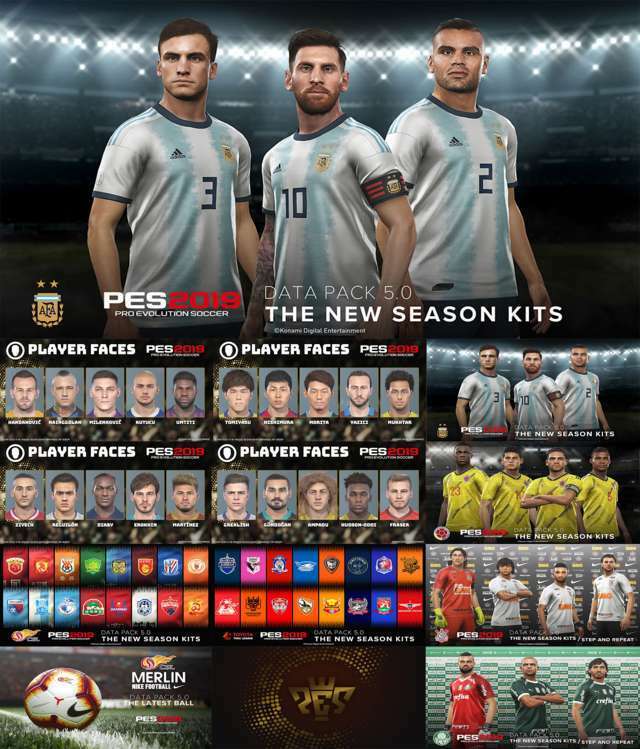 Additionally, over 100 player faces have been updated from leagues around the world. PES 2019 debutants, Arsenal FC’s Guendouzi and FC Barcelona’s Arthur are just two of the players that will now closely match their real-life counterparts. France’s Ligue 1, Portugal’s Premiera Liga and several other league’s kits have also been updated to the latest versions. As always, we aim to provide a more authentic and realistic game experience. We hope you enjoy this latest update. Two new licensed leagues added (Chinese Football Association Super League with players such as Paulinho, Mascherano, Oscar and Hulk, and the Thai League that has been on the rise in Asia). Two new stadiums added (You will now be able to play at our official partner AS Monaco’s home stadium, Stade Louis II, and the eSports stadium, eFootball.Pro Arena). New boots added (The latest adidas, NIKE and PUMA boot models have been added to the game). Player face updates (Over 100 player faces updated from around the world). New player portraits photos added (Several new player portraits that can be seen when setting formations and checking player stats during matches have been added). We have removed several songs from the game temporarily due to unforeseen circumstances . These songs will be returned to the game's soundtrack once all relevant issues have been resolved. 0 Response to "Data Pack 1.0-5.0 For CPY Version - PES 2019"